Window contacts tell users if a window is open or closed. Typically, such sensors are wire-based. Scientists working with industry partners recently developed a new system that operates without wires or batteries. It draws its power from its environment: from sunlight and ambient heat. A bad weather front is fast approaching and a cloudburst is imminent. If you happen to be away from home, but have left a window open, either deliberately or because you forgot to check one room, you may be in for a wet surprise when you come home. However, it does not have to be like that: Thanks to a new sensor system, such situations can now be avoided. 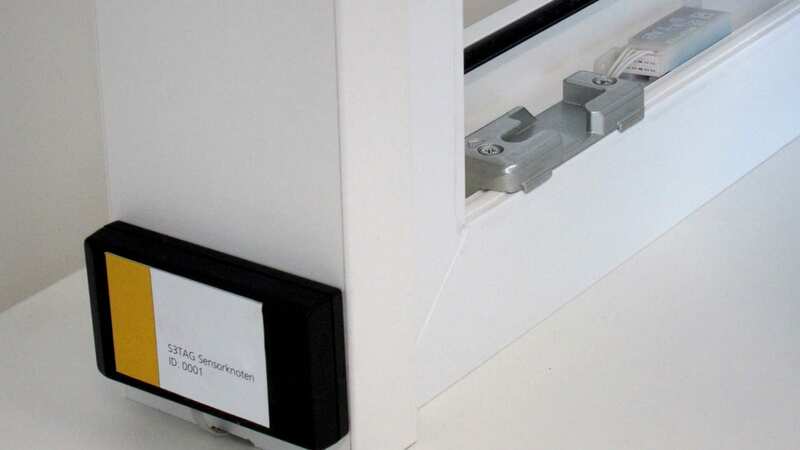 A sensor embedded in the window frame detects if a window is closed, cracked open or wide open and sends this information to a base station at the main door. When leaving the house, a resident can tell at a glance which windows are open and which closed. Since the system enables remote queries, users can even monitor windows via a smartphone. Researchers at the Fraunhofer Institute for Integrated Circuits IIS, based in Erlangen and Nuremberg, have developed the product in close collaboration with Seuffer, a Calw-based company which has been an IIS industry partner for over a decade. The intelligent window monitor is based on the IIS-developed HallinOne® sensor – a 3-D magnetic field sensor that is already being used in mass-produced washing machines, where it determines the exact position of the drum. “We’ve adapted our technology for the window application. A fingernail-sized sensor embedded in the inner frame detects sash and handle positions by measuring any changes in the angle and position of a magnet that’s embedded in the bottom of the sash. When you lock the window, for example, the magnet moves to the right,” explains IIS engineer Klaus-Dieter Taschka. “The sensor even detects if a casement window appears to be properly latched, but has actually just been pulled shut. No other system can do this.” In addition, the system is tamper-proof and so can help protect against break-ins. The magnet cannot be removed without the sensor detecting its removal. Also embedded in the frame is an RF node. Comprising a radio unit and a microcontroller, it uses the s-net® technology developed by IIS for extremely energy-efficient wireless data transmission to a base station. This can take the form of a PC, cell phone or tablet, even a room controller. “The s-net® wireless sensor network is a multi-hop network where sensor nodes exchange data both with each other and with master nodes,” says Taschka. Nodes have a communication range of 20 to 30 meters, which defines the maximum distance between one window and the next. Multi-hop capability means the system can cover vast areas, making it suitable for use in businesses. Installed in an office building, it could provide front-desk security staff with window status information and so do away with the need for walk-through checks. Another feature of the window sentinel is that it requires no cables or batteries. The sensor draws all the power it needs from its surroundings. The underlying technology, known among experts as “energy harvesting”, enables power to be derived from ubiquitous sources such as air currents, vibrations or in this case sunlight and ambient heat. Thermoelectric generators embedded in the window frame transform heat into power. Solar cells attached to the outer window frame also help power the 3-D sensor. “Our tests showed that this works even in north-facing windows,” says Andreas Buchholz, Head of Research and Development at Seuffer.